You'll be £19.99 closer to your next £10.00 credit when you purchase The Bantams. What's this? 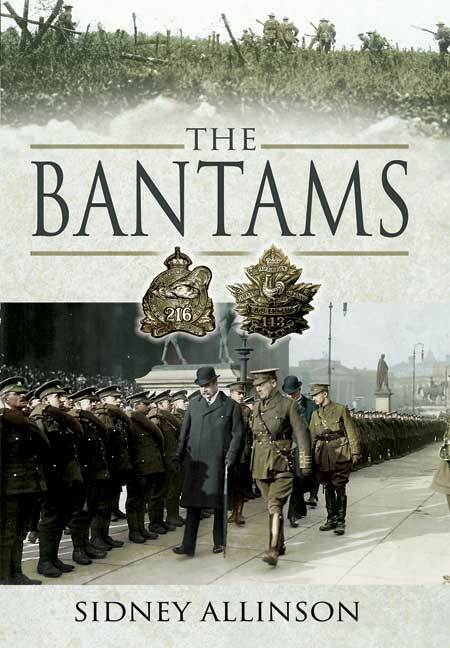 The Bantams tells the factual but well nigh incredible story of how the British and Canadian armies recruited over 50,000 short men to serve as front-line soldiers. Such Bantam battalions eventually numbered over twenty units in Britain, plus two battalions from Canada. The movement spread all over Britain, particularly the coal mining regions of Wales and Northern England, then to Canada, particularly among British immigrants there. Canadian military historian Sidney Allinson's researches took him to Britain, Canada, the U.S., and the old battlefields of Flanders. He contacted over 300 survivors of the Bantams, to gather the many first-hand accounts of battle told in his book. It reveals disturbing new information about battlefield executions by firing squads that was only recently released from British official records long held secret from the public. It adds even more poignancy to the story of how thousands of patriotic 'Bantams' -- not much taller than a rifle themselves -- well below the Army's 5ft. 3ins. minimum regulation height, flocked to the colours. In Canada, the 216th Bantam (Toronto) Battalion was recruited within a few weeks, and the 143rd B.C. Bantams was quickly raised on Vancouver Island. Soldiers from both these now-forgotten Canadian units served at Vimy Ridge and in other later battles. The British and Canadian armies recruited more than 50,000 Bantam soldiers to bolster their ranks during the Great War. The story of these diminutive men and their experiences in the trenches feature prominently among the folk-lore of World War One. Drawing on accounts from 300 survivors of the bantam battalions, this in-depth history covers every aspect of the bantam phenomenon. This is very much a stand alone source, ideal for the Great War enthusiast, although perhaps a little heavy for the casual reader. The Bantams gives one of the best accounts this reviewer has encountered of the rigors of trench warfare. This book is a must for all collections of World War One history and Canada's part in it. The citizens of LeHavre weren't prepared for the bizarre sight that greeted them after a British troopship arrived in the harbour in January, 1916, with a fresh contingent of reinforcements for the Western Front. The troops marched down the gangplanks as though they were mocking the traditional image of the stalwart soldier. They each were about five feet tall, seeming more like mascots than fighting-men. And so the first battalion of the Bantams, as they were officially called, prepared for battle. They soon proved they were equal in stamina and valor as standard-sized soldiers. By 1918, more than 50,000 Bantams, including 2,000 from Canada, served in the trenches, and their casualties were enormous. Yet the story of the Bantams' outstanding contribution to the war has been forgotten, overlooked, or even deliberately concealed by army historians, who were perhaps embarrassed by the episode. But thanks to a Toronto military historian, their story is now told for the first time, and it's enough to make short men stand tall. Sidney Allinson deserves credit for ferreting out the fascinating tale and for preserving it in the face of official indifference and even hostility. His experience documents again the widespread illogical prejudice against people who happen to be short. Allinson's book is a tribute and a triumph: excellent reading, it touches the heart, yet lays bare the evil of war. This is a book to be read by all students of military history, together with those who have a particular interest in the British soldier's life in World War I. It is also recommended reading for anyone who questions the continuation of Remembrance Day. Allinson bases the book on interviews, letters, and diaries, and wrote it to bring 21 battalions out of obscurity. Nobody who reads this account is likely to forget them.